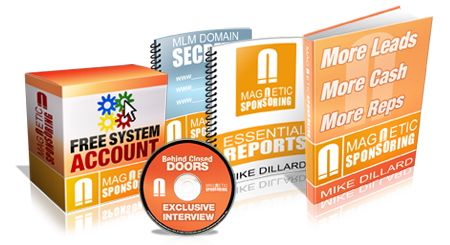 Magnetic Sponsoring is considered the Holy Grail of Attraction Marketing in The Industry. “Most people spend all their money and time calling over-priced leads, only to end up talking to some guy named “Bubba” who’s really looking for a J-O-B. Others jump from company to company hoping “this one” will be the one that really works out. But the richest and savviest distributors don’t do ANY of those things. We do not cold-call leads. We do not show the plan to everyone with a pulse. And we do not bother our friends, family and neighbors. Instead, we use what I call magnetic sponsoring. Magnetic Sponsoring revolutionized the entire industry with its ground-breaking tactics on how to become a true leader and attract prospects to YOU. This is the bible on how to become the hunted rather than the hunter. You’ll discover how to attract an endless stream of new distributors and customers to you, with credit card in hand ready to join. Say goodbye to chasing people down to join your business and actually make money from all the people who say “no” to your opportunity.